Next weekend, well, really this up coming weekend I'm having a pumpkin carving party for my adult friends. A chance for mom's to have some Halloween fun and leave the munchkins with dad or a sitter. 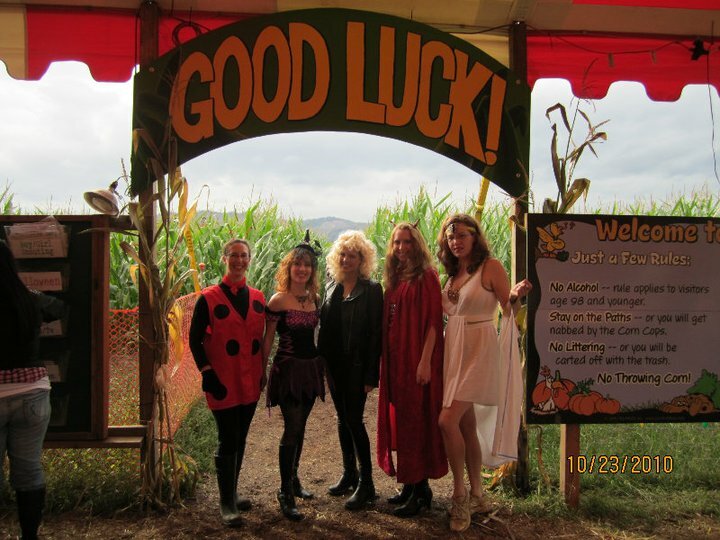 Last year when I did the party I had everyone dress in costume and we went to a pumpkin patch to go through the corn maize before going back to the house and eating and carving. It was fun going through the maize all dressed up. We could hear other people saying, "we should have dressed up, that looks like fun" :) Never too old to dress up and go through a corn maize. 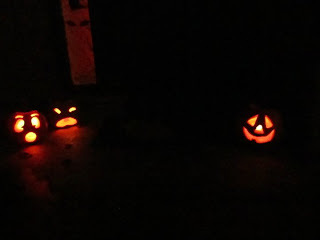 After picking out our pumpkins we headed back to my house to eat and watch Shaun of the Dead while we carved pumpkins. We had all seen the movie before so it was easy to carve and "watch" the movie. 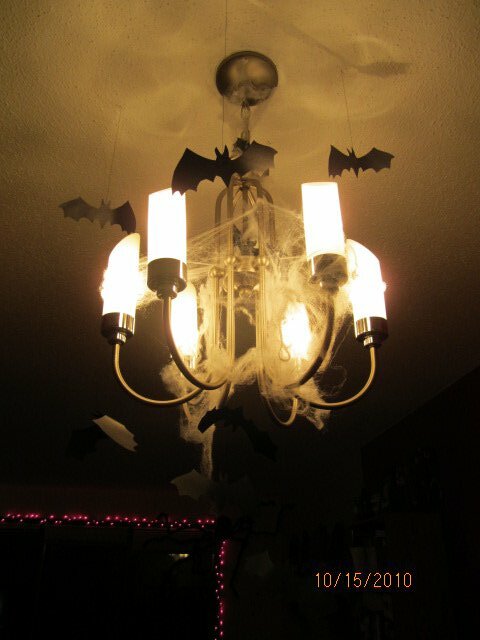 I looove decorating for Halloween. 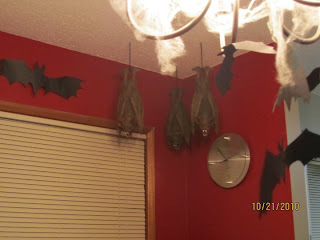 Every year I buy something new...on sale of course :) This was our entry way. Now normally, I really dislike spiders in the house but come Halloween, they're EVERY where! Bat's, I LOVE them. I don't have enough of them. I need to keep my eye out for some sales and STOCK UP! Refreshments. You know it, I went for the cheesy Halloween labels. 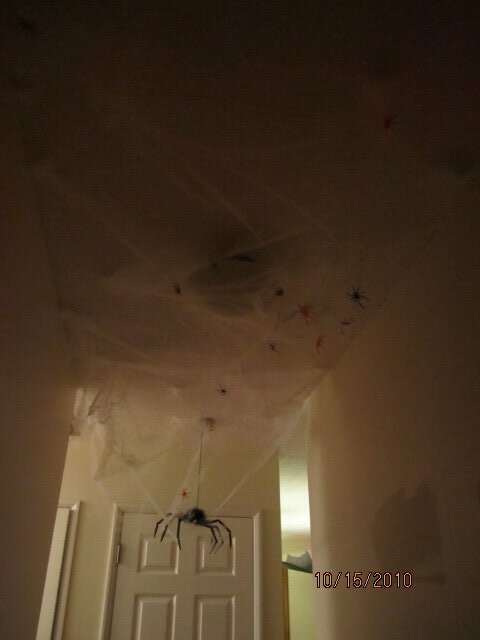 But hey, everyone loved the little detail. 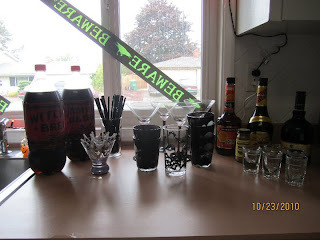 My husband HAD to have those skeleton glasses when he saw them and I'm glad he bought them, because they're perfect for small Halloween parties. 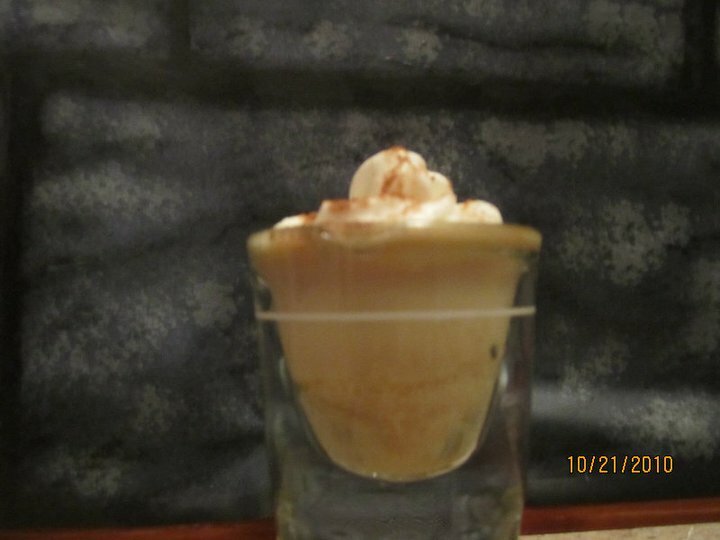 Pumpkin Pie shots was the speciality drink. 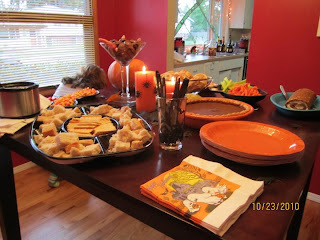 My guests all brought some of the yummy food you see here. Crab dip with bread and crackers, pumpkin pie perfect for the occasion. Ha ha, those napkins are ancient. I'm not kidding. I've had those since my 20's. The pumpkin cream cheese roll I made and I highly recommend it for any Halloween party you are attending. You won't be bringing home left-overs I guarantee. 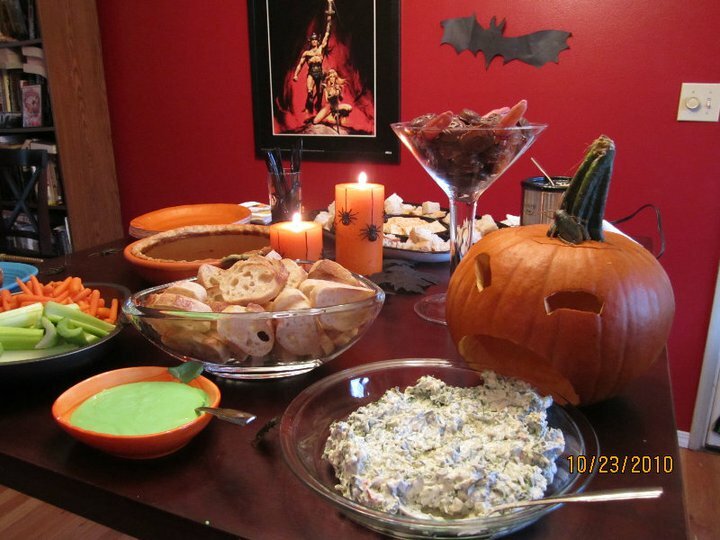 Puking pumpkin spinach dip :) party classic. I dyed the ranch dressing green to make it more festive and those are my homemade peanut butter cups with severed fingers in the martini glass. 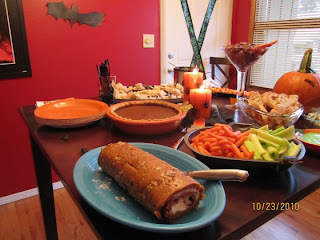 The severed fingers looked so real some of my guests didn't want to eat the chocolates hee hee. Oh and don't worry, I'll be sharing that homemade peanut butter cup recipe in a later post. A few of our finished pumpkins. Great time with girlfriends. 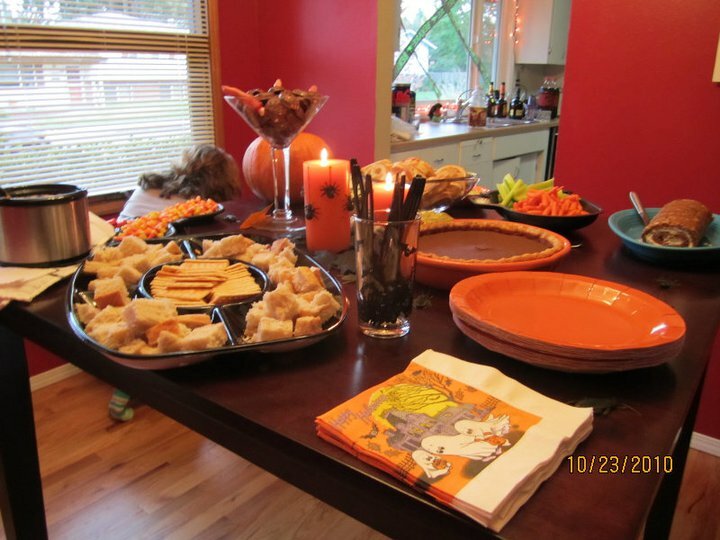 I highly recommend you host your own pumpkin carving party. I bet it was a fun time with friends! Susan, it was so much fun! Thank you for stopping by and showing this older post some love.